We were impressed with the sheer versatility of this large metal building. Whether you’re looking for a workshop for a small business, a place to carry out your hobby, a secure area to store flammable materials, or simply a garage to park your vehicle in, this building ticks all the boxes. 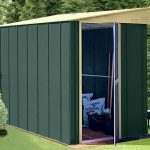 Easy to assemble, you can install it yourself within two days, so saving the cost of paying to have somebody build and install it for you. The heavy grade steel double doors give access to the full frontage of the garage, so even larger vehicles should have no difficulty in getting in and out. There is also a single personnel door, and we were impressed that this could be situated in different positions, so that it can fit in perfectly with the unique design of your property. Weather protection is also excellent on this workshop. The apex roof itself prevents water from remaining on top of the structure, and the metal used is hot-dipped galvanised steel, which has excellent rust proof qualities. Because of that, it’s a building that will look good for years to come, and that’s backed up by a very welcome 20 year manufacturer’s guarantee. 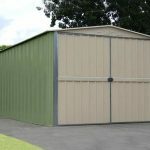 Despite the price tag, all of these factors make it a great choice if you need to add a durable workshop or garage to your property. 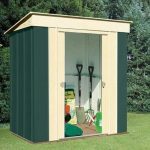 You might also like to see the top 20 steel sheds currently on sale in the UK by visiting the WhatShed steel sheds awards league table. The first thing we noticed about this large metal building was its size, which opens up a wealth of possibilities for its use. 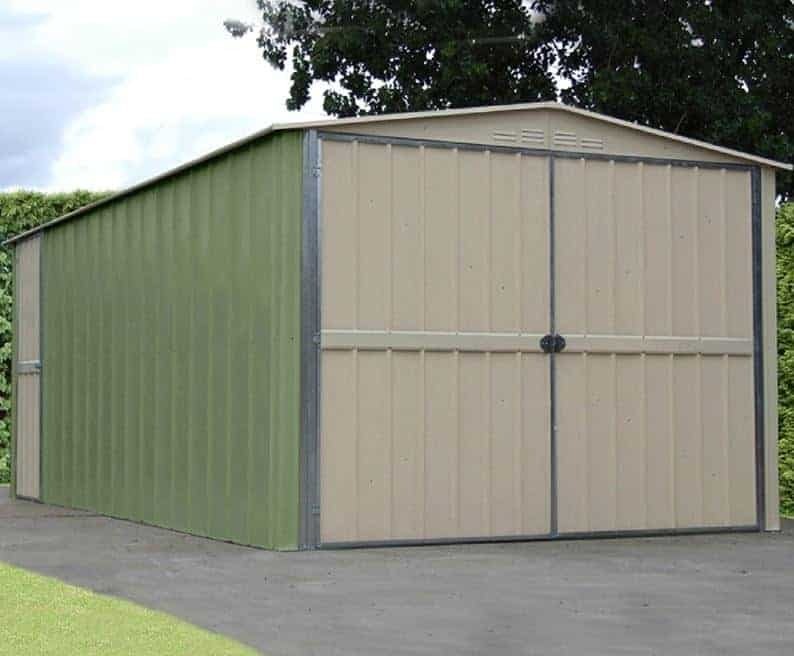 Certainly it would make an excellent single garage, whether for a standard sized car or even a 4×4, but it’s also an ideal workshop space or large scale metal shed. Thanks to the skylight and integrated ventilation, we found it a comfortable environment to spend time in. The roof is made up of tough translucent sheets and formed into an apex design. This is an important feature, as not only does it give increased storage and headroom, it also means that rainfall is carried harmlessly away rather than forming puddles on the roof. At its ridge, the roof is 2.25m, and the eaves have a height of 2.00m. 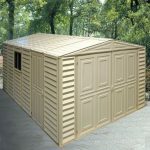 The dimensions of the shed itself are 5.78m deep and 2.95m wide. 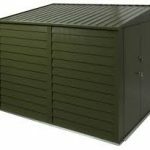 The cladding is all important in a metal shed, as it has to be able to resist year after year of often wet and windy weather. From first sight we could tell that this was a durable and well fabricated building. The metal used is high tensile hot-dipped galvanised steel with a thickness of 3mm. This is not only strong and durable, it won’t be affected by rust or by extremes of temperature. We liked the fact that this workshop has rounded corners as well, as this again improves strength and stability. There is no floor provided with this workshop, but that allows you to position it wherever you please. We recommend concrete for this purpose, as you’ll need a flat and stable area that is at least as big as the dimensions of the building. A large area of concrete slabs or paving could be used for this purpose, or alternatively such an area could be constructed prior to the workshop being delivered. We were especially impressed with the 20 year guarantee provided by the manufacturers, as this shows both the high quality of materials that have been used, and their confidence in their product. It’s a confidence that the consumer can take too, so once the structure has been installed there really should be nothing to worry about for the next two decades. As the workshop is already painted, there’s nothing special that the consumer needs to do to keep the warranty valid, so this in itself can save time and money. The paint applied, in three coats of cream and light green, was of a high quality and was resistant to chipping and scratches. When reviewing garages of this size, it’s always pleasing to find an extra personnel door as this also increases its suitability as a workshop or metal shed. 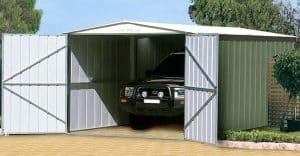 The double doors themselves are 1.95m high and have a width of 2.60m, so if you are using this building as a garage you won’t have to worry about catching the sides of your vehicle as you drive in. The personnel door is of the same height, but with a much narrower width. All doors are made of high grade galvanised steel that’s even stronger than that used in the rest of the structure. There are no windows in this building, but there is a skylight within the apex roof. This let in a considerable amount of natural light, which helps to create a pleasant atmosphere. The gables also come with ventilation as standard, which is very useful whether the building is used as a garage or somewhere that you’ll be spending more time in. Security is of prime importance if you’re storing something as expensive as a car inside, so we were a little disappointed that there was no padlock or chain supplied as standard to go with the pad bolt door locking system. Nevertheless, there are many relatively inexpensive systems to buy, and this does allow the consumer to make their own decision about what kind of garage security system they use. One positive feature of this workshop, from a security and privacy point of view, was the absence of windows. This means that passers by have no way of seeing what’s stored inside, so your valuables will be hidden away. We were a little disappointed to see that there were no optional extras available directly at the point of purchase from the manufacturer, but there are a wide range of features that can be added. As we’ve said, security has to be the first priority. A high quality padlock and alarm system is a must, and it may be worth considering installing a CCTV system. Just the sight of surveillance cameras can be enough to deter opportune thieves. It’s also a pity that a base kit wasn’t available, although the manufacturers do provide clear instructions on how to construct a suitable base. A set of 28 galvanised screws are essential for this purpose, as they need to be as weather resistant as the workshop itself. Another option that a buyer may consider is an automated door opening system, and there are a number of garage door specialists who can convert the doors supplied by Shed Baron. 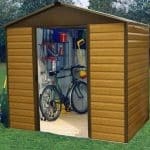 When reviewing this workshop/garage the high quality of material used was evident at all times. The painted finish is also excellent, creating an attractive exterior not always found on metal sheds. A 20 year lifespan is guaranteed by the manufacturer, and this is possible because of the hot-dipped galvanised steel used during fabrication. You can forget about rust. If used as a garage, there’s easily enough room for a large 4x4 vehicle, so driving a standard sized car in and out will be very easy. There’s also lots of space if you choose to use this as a workshop, and shelving can be screwed onto the frame. Even if you only have yourself and a friend to put this garage together you’ll be surprised how easy it is as long as you follow the instructions to the letter. Seventeen hours should be set aside for the assembly, so it makes sense to spread this over two to three days. Even though the price is above the thousand pounds mark, we still feel it provides quite good value for money when the quality, size, and longevity of materials used is taken into consideration. Final Thoughts: This is an ideal choice for an additional garage, but we think it would prove even more useful as a workshop. Internal lighting would need to be fitted if you plan on working in there, although the skylight does let in a surprising amount of natural light. There’s lots of space to store items or install machinery. Security will need to be added by the owner, but that needn’t be expensive, and the window free design is itself a useful security feature. This is a well fabricated building that will last and last, whatever the weather, as the very generous warranty shows.